SouthCreek is a member of the prestigious Myrtle Beach National family and the shortest of the three Myrtle Beach golf courses. With its own distinct character, SouthCreek will test your game. Designed by Arnold Palmer, this course measures at 6,400 yards from the back tees and requires accuracy off the tee. Local and visiting golfers alike agree that SouthCreek is a one of a kind course and a must play for all Myrtle Beach golf vacations. Palmer’s style of incorporating the natural terrain of hardwoods and Lowcountry wetlands makes this course one of the best designer’s blueprints. Still wonder what to expect when golfing SouthCreek at Myrtle Beach National? Expect undulating Mini Verde greens, dogleg fairways, impressive holes, and challenges! The 10th-hole is a par 5 and wraps as a dogleg right around the sizeable lake. The 13th-hole is a par 3 has a large waste bunker leading up to a small green. The 18th-hole measures 380 yards from the tips. This finishing par 4 plays a dogleg left and fronting the green is a steep-faced bunker, requiring a force carry to the green. Meanwhile, winding waste areas buffer the Tif-eagle greens. SouthCreek is an excellent course to play no matter your handicap and designed to entice players to use skill rather than strength. The course received a 4-Star rating from Golf Digest in “Places to Play” rankings. 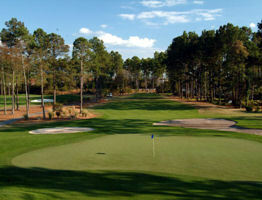 SouthCreek is voted as: “Top 100 in America” by Golf for Women as well as among the “Top 25” Myrtle Beach courses. SouthCreek is a member of the Prime Time Signature Package and reservations are suggested. Nearby resorts in Myrtle Beach and hotels in Myrtle Beach make timely tee time arrivals a snap. For those large groups that require more space than Myrtle Beach hotels allow, consider booking a Myrtle Beach Condo. No matter the golf courses or accommodations selected, all golfers enjoy Myrtle Beach because South Carolina golf rocks! Beautiful course! Great employees service fantastic!! Great course! See my review on myrtle beach national. Course is in great shape. Enjoyed playing this course. 5 hour round. Too long! One of three golf courses at Myrtle Beach National. South Creek very challenging, but risk reward. Will use all your clubs in your bag. Great course. Fairways and greens were in great shape! Golf Course was exellent! ! With such a wet season these guys did a wonderful job!! Hats off !! Staff were very friendly and accommodating. This course requires some target golf but was enjoyable and in great shape. Great track that is always in great shape. Greens were plush. A well run course in a fantastic setting. My only criticism is the course condition didn't really meet what I envisioned a Championship course would be like. Maybe it's still very early in the season, but the greens were looking a little jaded and over used. The best of the best in this upscale community. The course is my all time favorite. People from all over the U.S come to play south creek. SouthCreek is a member of the prestigious Myrtle Beach National family and the shortest of the three Myrtle Beach golf courses.